Before it was a viola, it was a plain maple board. Maple is a preferred wood for solidbody instruments because it’s dense, close-grained, and carves well, it holds up to changes in air pressure and humidity, it’s strong and doesn’t warp, scratch, or split easily, and it transfers sound well, which is good for instruments that require electronic pickups or transducers. I carved the body from the maple board pictured above and attached it to a separate curved piece at the bottom to support a chinrest and the transducer jack. The fingerboard is made of ebony and was purchased at Ifshin Violins in Berkeley, CA. I bought the fingerboard in a semi-finished state – it was already shaped, but I smoothed it out with two steps of fine sandpaper and polished it with #0000 steel wool. The bridge is a standard viola bridge (the kind with adjustable feet, good for a flat surface), also obtained at Ifshin. To reduce the weight on the top end, I mounted the tuners – in this case Schaller Rotomatics – on the bottom end rather than where the peghead should be. The strings are threaded through small holes at the top of the neck and anchored to the underside with rubber washers. I got the dimensions for this instrument from a 16-inch viola. The black wire from the transducer jack to the bridge ends in a folded copper tab that slides into the bridge slot; the tab transfers vibration in the bridge to a piece of piezoelectric material that converts this vibration into electricity, which is in turn converted into sound by an amplifier. 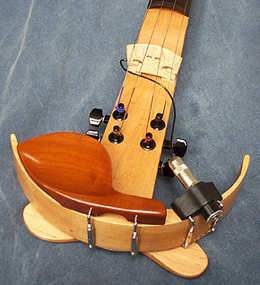 The transducer is a Fishman violin pickup. The chinrest came from Ifshin. I splurged for a nice wooden one instead of a plastic one. The tuners are mounted on the underside of the body because that’s how you’d mount them on a guitar – notice the absence of a standard tailpiece. Fine-tuning pegs are not an issue here, because guitar tuners provide more precision that standard tuning pegs do. The tonguelike thing underneath the instrument is a shoulder rest shaped from maple and attached to the underside of the body. This entry was posted in D.I.Y. Instruments on December 7, 2013 by thallenbeck.